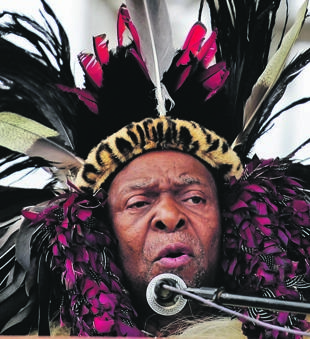 Zulu King Goodwill Zwelithini has failed to convince the Land Claims Court to order his subjects to share land, which was won in a successful land claim, with him. In a judgment handed down by the court this week, it also made a cost order against the Ingonyama Trust – an unusual occurrence in this court. City Press’ sister publication, Rapport, has previously reported that the Ingonyama Trust had intervened in the land claim in order to have the land which was the subject of the claim – and which borders Ingonyama Trust land – awarded to the trust. This claim was based on the fact that the successful claimants were Zwelithini’s “subjects”. The Entembeni, Makhasaneni and Mthonjaneni communities had claimed 11 000 hectares of land, located in the Melmoth district, about 90km west of Richards Bay and 50km east of Nkandla. The claim includes prime agricultural land for sugar cane, avocados, lumber and cattle farming. The current owners and the government had, in principle, agreed to sell the land for R760 million, but Zwelithini intervened before the claim was finalised. The successful claimants are currently living on trust land, after being forcefully removed from the land that is the subject of the claim. In court papers, the Ingonyama Trust went as far as saying there would be “conflict, chaos and blood-letting” if the court allowed the community to own the newly acquired land. According to the trust, it did not want to grab land or claim ownership, but believed that the most suitable option was for it to hold the land on behalf of the community. As an alternative, the trust wanted government to own the land, rather than the community. This week, the Land Claims Court decided that the claimants may well be Zwelithini’s subjects, acknowledge the authority of the king and currently reside on his land, but they still have the right to acquire land in their own name. The court, assisted by an assessor who specialises in customary law, found that the Ingonyama Trust could not prove that the majority of the claimants wanted the trust to own the land in their name. This was especially clear because the claimants had already set up their own communal property associations to own the land on behalf of the community, and had also elected trustees. According to the judgment, it would be unfair to give the valuable land to the trust under circumstances where it was not the trust that had a valid claim over the land. “I can see no reason why the court should lend more weight to the wishes of the Ingonyama Trust over the wishes of the claimant communities,” said acting Judge MP Canca. The land claimants argued that the Ingonyama Trust was just being opportunistic in its bid to try to acquire the land. Khumbulani Myeni, legal representative of the Mthonjaneni community, said his clients were ecstatic about the judgment. “They have been trying to get their land back for more than 20 years. According to Myeni, the trust attempted to prevent the claimants from settling their claim when it interfered in the negotiation process two years ago. In his judgment, Canca said the Land Claims Court only makes a cost order in exceptional cases. The court held that the trust’s conduct in this matter did constitute such an exceptional case because it “very clearly had no interest to protect in the court case”. Now that the preliminary matters have been dealt with, the court will move on to finally determining the remainder of the claim. What do you think of the Zulu king trying to get more land? What do you think of his threats of violence if the community is handed the land?